Bring your cosplay to a whole new level by joining the STGCC Championships of Cosplay 2018. The event will be held on 8-9 September this year at Marina Bay Sands in Singapore. Deadline of application is on August 12, 2018. The competition is sponsored by SINGER this year and the prizes are pretty attractive. What is the STGCC 2018 Championships of Cosplay? 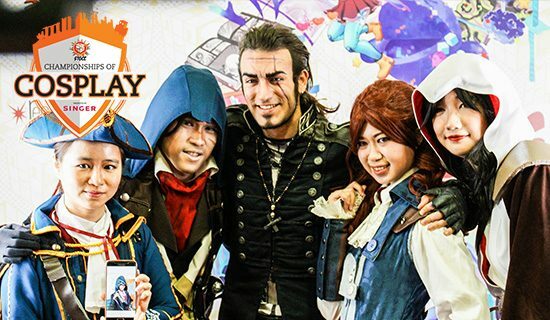 The STGCC 2018 Championships of Cosplay presented by SINGER® is a craftsmanship award show with a pre-judging session and a stage display. Entries must represent a character or element from the pop culture realm, including comic books, movies & television, video games, anime & manga or fantasy. Comic Books – Examples include: Superman, Spider-Man, Poison Ivy, Dr. Doom, Rogue, etc. Movies & Television – Examples include: Darth Vader, The Doctor, Rick Grimes, The Terminator, Daenerys Targaryen, Hit-Girl, etc. Video Games – Examples include: Master Chief, Sarah Kerrigan, Booker DeWitt, Lara Croft, Link, Samus Aran, etc. Anime & Manga – Examples include: Ichigo Kurosaki, Mikasa Ackerman, Sheryl Nome, Captain Harlock, Eva-01, etc. Fantasy – Examples include: Witches, Princesses, Zombies, Pirates, Vampires, Steampunk, etc. Needlework – Cosplay constructed primarily through sewing, stitching, embroidery, etc. Armour – Cosplay constructed primarily by molding and shaping its outer layers using acrylic, EVA foam, worbla, wonderflex, cardboard, etc. FX – Cosplay that primarily features animatronics, optical effects, mechanical effects, special effects makeup, prosthetics, etc. Larger Than Life – Cosplay that encloses the maker and extends their limbs by at least one foot in length. Each entrant will submit an application to be reviewed by the STGCC team. Entrants may only enter one costume into the competition. Shortlisted contestants will be contacted by the STGCC team and advance to the competition stage. Contestants will be judged solely on the quality and craftsmanship of their costumes. No store-bought costumes will be eligible to enter. Shortlisted contestants will be pre-judged for craftsmanship off stage and then compete on the STGCC main stage. Each contestant will be given approximately one minute to exhibit two to three poses before exiting the stage. No speaking or individualization of music is allowed as pre-selected music will play throughout the competition. If you are interested to participate CHECK OUT THE APPLICATION HERE.